Norse God of wisdom and war. Our Flocks protector, Odin was born 3/11/16. He is from Thistle Haven’s Hunter and Liliana. Odin is a very big beautiful boy, still somewhat of a pup. He is just as happy watching the animals as running and playing with our German Shepherd. He is raised with goats, llamas and pigs. Egyptian Goddess of war, hunting and wisdom. Fits our beautiful intelligent protector and fighter. Neith was born 3/24/16. 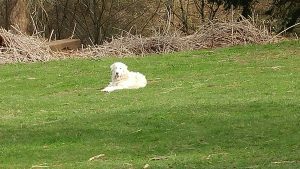 She is from Leeping Lamb’s Maremma’s Leonardo and Bella. Neith is an exceptionally sweet, gentle dog with the animals. She is raised with goats, llamas, pigs, chickens, ducks, and is buddies with our German Shepherd. She is a wonderful protector, and continually watching for anything out of the norm. Neith recently had her first litter of pups. See our “For Sale” page. She is a fantastic Mom with 8 adorable pups.